One of these days, I had to make some finger food for the baby shower of one of my friends. I put some thought on what can I make that wouldn’t require too much effort and yet would be liked by everyone. I happened to browse through the cache memory of my processor(brain :-P) and this dish popped up as a result. I remember one time when we visited one of our friends, they had served stuffed mushroom as appetizer. I am glad I tried that dish that day. Because I would have never attempted to try something using mushroom considering the fact that neither DD nor me are too fond of mushrooms. 2. Wash, clean and pat try the mushrooms using a kitchen towel. 3. Break off the stems carefully without tearing the mushroom caps. Finely chop the stems and keep aside. 4. Heat oil in a skillet. Add chopped garlic and fry till it becomes light brown. 5. Then add chopped mushroom stems. Fry well till the mushroom stems loose its moisture. Add chopped chives and fry for another 2-3 mins. 6. In a bowl, mix together cream cheese, ground black pepper, sour cream and the fried mixture. Add salt if required. The mixture should be thick. At this time add salt only if you feel the need and mix well. 7. To each mushroom cap, spoon in the filling carefully. 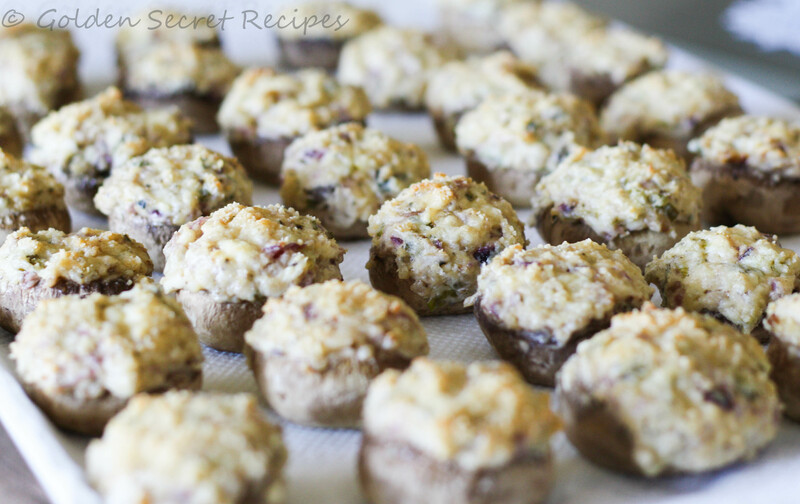 Place the mushrooms in a greased baking tray and sprinkle some shredded parmesan cheese over the mushrooms. 8. 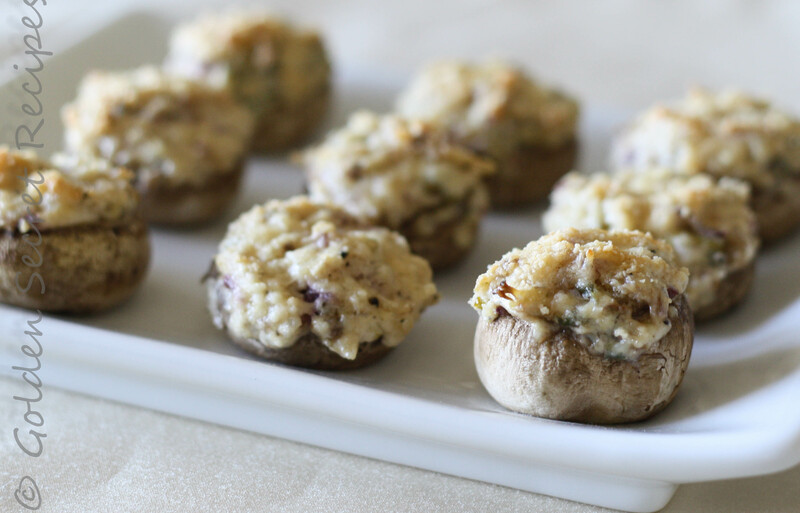 Bake for 20 minutes in the preheated oven or until the mushrooms starts to ooze out water and they turn golden brown. TIPS: You could bring many variations to the filling as per your preference. You could add chopped spinach to your filling. Instead of chive, you could use 1 tsp onion powder. You could skip sour cream or add more sour cream and if you want to make it more spicy add 1/4 tsp chopped green chilli/cayenne pepper. Make it as per your taste and enjoy this appetizer. This entry was posted in Appetizer 'N' Starters, Quick 'N' Easy Recipes, Specialities-Veggie and tagged american mushroom recipe, baked mushroom recipe, easy finger food recipe, easy snack idea, finger food using mushroom, finger food with mushroom, mushroom, quick and easy snack recipe, quick snack, stuffed mushroom recipe, stuffing for mushroom, white mushroom, white mushroom stuffed, yummy stuffed mushroom. Bookmark the permalink.